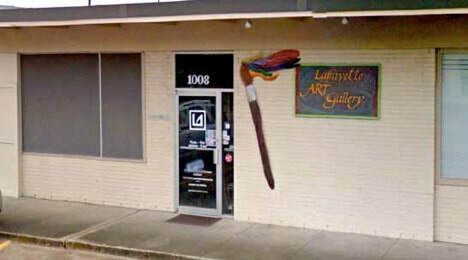 The Lafayette Art Association had its beginnings in 1959.
it is governed by a rotating Board of Directors, and its Officers, elected annually by the membership . Marvin and Ann Dubos/Lafayette Art Association Fine Art Scholarships, University of Louisiana at Lafayette (continuous since1982). Ron Kern Scholarship in theatre. Furnished gallery and parking lights at the University of Louisiana at Lafayette, Hilliard Art Museum. Sponsor Kids Are Artists Too competition for youth, birth to 8th grade since 1984. Maintains and supports professional art galleries located within the LAA premises and several satellite galleries throughout the community. Space is vigorously used for meetings, competitions, exhibitions, lectures, classes and workshops. Except noted otherwise, all competitions, exhibitions and receptions are free and opened to the public. Publish an annual membership directory, website (www.lafayetteart.org) and monthly Newsletter. Art competitions hosted for over 32 years with two annual competitions judged by national/international jurors. Several annual exhibits are members-only in order to encourage beginning artists to exhibit and, consequently, grow their confidence and art. These are the only competitions in Lafayette open to beginning artists. Memberships - LAA assisted in organizing the Acadiana Arts Council and remains a member; Lafayette Convention and Visitors Commission, Louisiana Partnership for the Arts. Advise and support area festivals, coordinating art exhibits, judge area competitions and provide judges for regional art competitions gleaned from LAA membership. Ongoing rotating shows and exhibits for the Lafayette Consolidated Government building. The LAA sponsors exhibits at several other satellites including restaurants, local businesses, and tourist centers. Sponsor of the annual regional photographic art competition, “Freeze Frame”, a 2-D juried and judged exhibit of original photography; entrants need not be members of LAA. Annual sponsor of the Eye of the Beholder (est. 1985) 2 and 3 dimension juried and judged competition of original artwork; entrants need not be members of LAA. LAA staffed by volunteers since 1995; staff coordinates and hangs over 60 annual exhibits community wide. The Lafayette Watercolor Guild (est. 2008) sits under the umbrella of the Lafayette Art Association. The state organization of PMC Metals, L’esprit Du Metal, is home based at the Lafayette Art Main Gallery. We believe that the arts contribute immeasurably to the spirit and welfare of the community. We support and encourage a wide range of artists, regardless of age, race, national origin, religion or creed. Help LAA promote and support art & artists! The Lafayette Art Association is supported by an External Agencies Funding Program grant, sponsored by the Lafayette Consolidated Government, and administered by the Acadiana Center for the Arts. 1008 E. St. Mary Blvd.